CARPINTERIA, Calif., Jan. 19, 2009 -- Antenna technology designed and built by Northrop Grumman Corporation (NYSE:NOC) made it possible for a radar sounder instrument aboard NASA's Mars Reconnaissance Orbiter (MRO) to detect huge glaciers on the Red Planet covered by a layer of dust and rocks. The antenna was developed by Astro Aerospace, a business unit of Northrop Grumman's Aerospace Systems sector, for the Italian Space Agency's SHAllow RADar (SHARAD) instrument. SHARAD probes below the Martian surface using radar waves in the 15-25 MHz frequency band for high-depth resolution. Scientists analyze the reflection of radar waves to characterize the Martian surface and subsurface layers of rocks, dust and ice. A radar capable of seeing deeply requires a very large antenna such as SHARAD's, which is 10 meters (32.8 feet) in length but weighs less than three kilograms (6.6 lbs). "The SHARAD antenna combines our specialized ability to provide both a super lightweight structure and one with the necessary scale for the successful Mars Reconnaissance Orbiter mission," noted Chris Yamada, general manager of Strategic Business Units, Northrop Grumman Aerospace Systems. 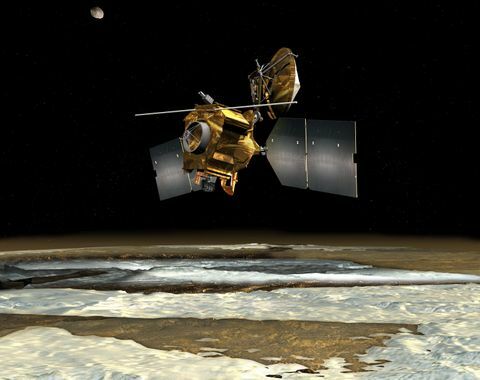 Scientists analyzed data from the spacecraft's radar instrument and reported in the journal Science that glaciers cover miles of the Martian surface, extending from edges of mountains or cliffs. These recent glaciers were found at much closer to the equator than is stable at the surface given current Martian conditions. SHARAD is able to see through the surface layer of dust and rock that insulates and preserves the glaciers. One of the glaciers is triple the size of the city of Los Angeles and up to a half-mile thick. The presence of large amounts of ice at these latitudes could be used as a source of water to support future exploration of the Red Planet. Astro Aerospace, with a 100 percent success record on hundreds of space deployables, recently was recognized by NASA's Jet Propulsion Laboratory for development, testing and on-time delivery of SHARAD's antenna under the constraints of a short development cycle for the SHARAD radar sounder instrument. The SHARAD antenna uses a similar technology to the MARSIS antenna built by Astro Aerospace for the European Mars Express spacecraft. The MARSIS antenna successfully deployed to a length of 40 meters (131 feet) once Mars Express entered the desired orbit around Mars. Northrop Grumman Astro Aerospace, based in Carpinteria, Calif., is a leader in the development of space, defense and electronics systems. For more than 50 years, Astro Aerospace has pioneered the technology of space deployable structures including AstroMesh furlable reflectors, antennas, truss masts, telescopic booms, storable tubular extendible members, solar array and planar radar-array deployments. The Jet Propulsion Laboratory of the California Institute of Technology, Pasadena, manages the Mars Reconnaissance Orbiter mission for NASA's Science Mission Directorate, Washington. Lockheed Martin Space Systems, Denver, is the prime contractor for the project and built the spacecraft.